Age 77 of Owosso, formerly of Durand, died of an inoperable brain tumor on October 25, 2018 in Owosso, Michigan. Harold was born on February 27, 1941 in Durand, Michigan; the son of John and Merle Haist. He graduated from Durand High School in 1959. Harold is survived by his wife of 34 years, Eve Lynn (Wilson) Haist; brother and sister-in-law Bruce and Kay Haist; sister-in-law Martha Haist; nephews James (Michelle) Haist II and Peter (Jessica) Haist; nieces Jennifer Brimager and Heidi Capp and his Aunt Esther Telford. He is also survived by his six step-children Cheryl (Judson) Hanks, Phillip (Diane) Mosciski, Cathy (Robert) Kreshok, Andy (Laura) Mosciski, John (Ann) Mosciski and Nancy (Todd) Stroub. We're eternally grateful to Harold because he treated us as his own. Although we are not tied by bloodlines, the love and trust he gave us, is a precious gift and that's what counts as a real Dad to us. He was preceded in death by his parents; his brother James Haist and his step-son Matt Mosciski. Harold's life passion was being a Farmer. For this one farmer the worries are over, lie down and rest your head,Your time has been and struggles enough, put the tractor in the shed. Years were not easy, many downright hard, but your faith in God transcended,Put away your tools and sleep in peace. The fences have all been mended. You raised a fine family, worked the land well and always followed the Son,Hang up your shovel inside of the barn; your work here on earth is done. A faith few possess led your journey through life, often a jagged and stony way,The sun is setting, the cattle are all bedded, and here now is the end of your day. Your love of God’s soil has passed on to your kin; the stories flow like fine wine,Wash off your work boots in the puddle left by blessed rain one final time. You always believed that the good Lord would provide and He always had somehow,Take off your gloves and put them down, no more sweat and worry for you now. Your labor is done, your home now is heaven; no more must you wait,Your legacy lives on, your love of the land, and we will close the gate. 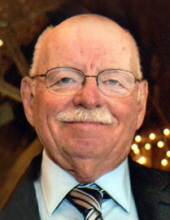 A Memorial Service is scheduled for Harold at Durand United Methodist Church on Friday November 23, 2018 at 11am. No flowers please, if you would like to donate, please consider making a donation to your local Future Farmers of America. To send flowers or a remembrance gift to the family of Harold Haist, please visit our Tribute Store. "Email Address" would like to share the life celebration of Harold Haist. Click on the "link" to go to share a favorite memory or leave a condolence message for the family.